I had a catmax enclosure installed in Feb. I would like to enter your competition. Feel free to use the pictures and story anyway. I’ll start at the begining. My cat Rusty was born in a field near my house last October with 3 sisters. His mum had had two kittens the year before. One lives next door and other disapeared when it was little. I didn’t want them to live there it was tough enough on their mum and she was likely to get pregnant again. I thought the best outcome would be to phone people who would resue and rehome them all because they were really nice cats. We knew the kittens had been born but I did not find them till they were 2 weeks old. DCH pet adoptions answered my call and caught the four kittens and their mother. I was not in a position to care for the mother cat or own a cat at that time. I was finishing building my house near by. 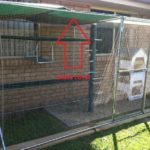 I always had the idea of a flap straight into a cat run because the last cat we owned a long time ago lost her life on a road. I continued to visit the kittens and choose the little boy (Rusty) to own myself. The tortishell girls slowly got adopted out too. They are all owned and happy now (mother too). I to take home rusty when he was 3 months old at the end of January. When the house I now live if was fully finished I put in place to have the cat run built which it was in April. By this time my cat had had all his injections was settled in and ready for his big adventures outside. He needed the stimulations if just sitting outside and watching the birds, digging in the sand and sleeping in the sun on his hammock. I sat outside with him for the first week and he slowly got used to it and now asks to be let outside every morning. I am sure because being outside is so much fun he learnt to use the cat flap in about a month by himself. It has enriched his life. He loves to be outside in all weathers except wind. He climbs the netting and I know it will hold him and not damage anything. 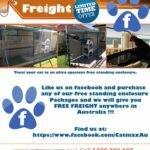 There was no way I was going to own a cat without having an enclosure and catmax seemed the best and now I know it is. When I need to replace the fence the net it attached to or have part of it fixed I know I can call someone to help with that rather than the net be installed at that is it. Rusty is a big fully grown almost 10 month old now. If it is too windy like today he sits next to his flap wishing he could be outside but not wanting to be in the wind. Thank you for making my cat’s life rich but safe. Please find attached photos of us on a nice day in the run a couple of weeks ago. There are more photos of us and the run if you would like them.